Today has been an interesting day. Us Rhode Islanders started off with a 1 hour delay due to really strong wind storms. It has been windy ever since. That being said, I got off to a late start. I have no idea where this painting came from. It is absolutely not in a “Mary” color palette. In fact it’s really dark and serious – totally not me. 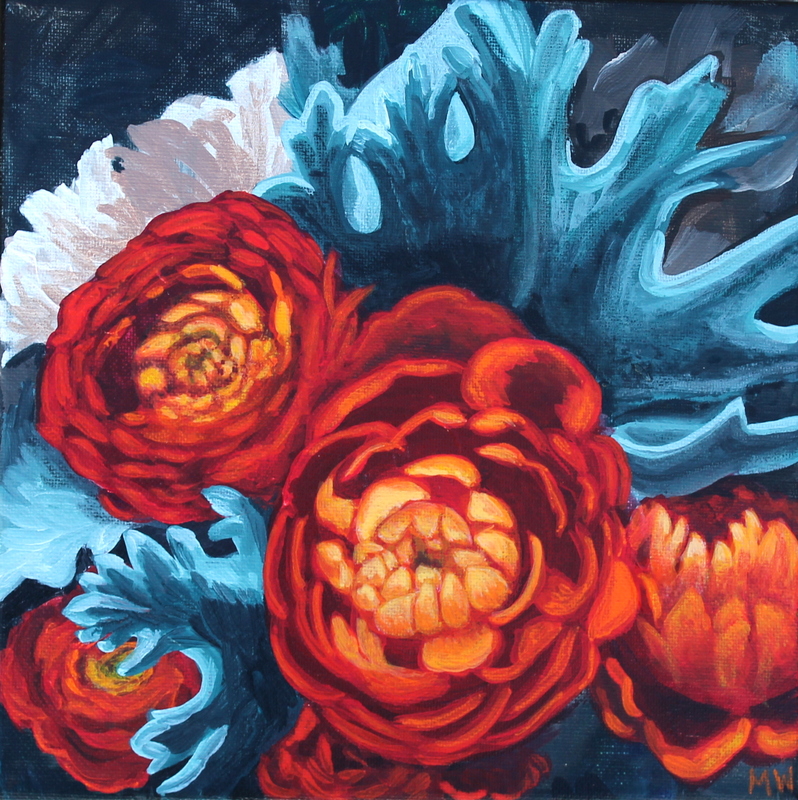 I knew I wanted to do ranunculus because they are one of my favorite flowers but usually one would associate them with light and airiness. I guess not today. I guess the storm clouds must have been hovering over my canvas. I was smart enough to take a photo every once in a while so you could see the method to my madness. Again, being time conscience, I opted to loosen up and only use larger brushes. Here is the finished product. Sort of wild and weird. Dare I say “bathroom art-ish”? I just said it. Bathroom art. That is what I think of. One of those serious toned, color-pallete-to-match your towels, paintings. AHHHHHHHHH!!!! HELP ME! NOT BATHROOM ART! Oh well, there is a place for everything and everything in its place. OK. Up an at it. It is 9am am I am going to try to focus again on finishing a painting in 5 hours (3 pm is my kid’s pick up time). I didn’t select fewer items although I should have. Instead I am going to try to really loosen up and only use large brushes. Large brushes=large strokes=faster? Not sure, but I will try. I really do have to learn to loosen up. Everything I do is more literal than gestural ….this should be good practice. I did it! I did it! I finished the painting by 2 pm! Wa Hoo! I’d say it was a little rushed, which threw some of the perspective off, but it forced me to be decisive and swift. 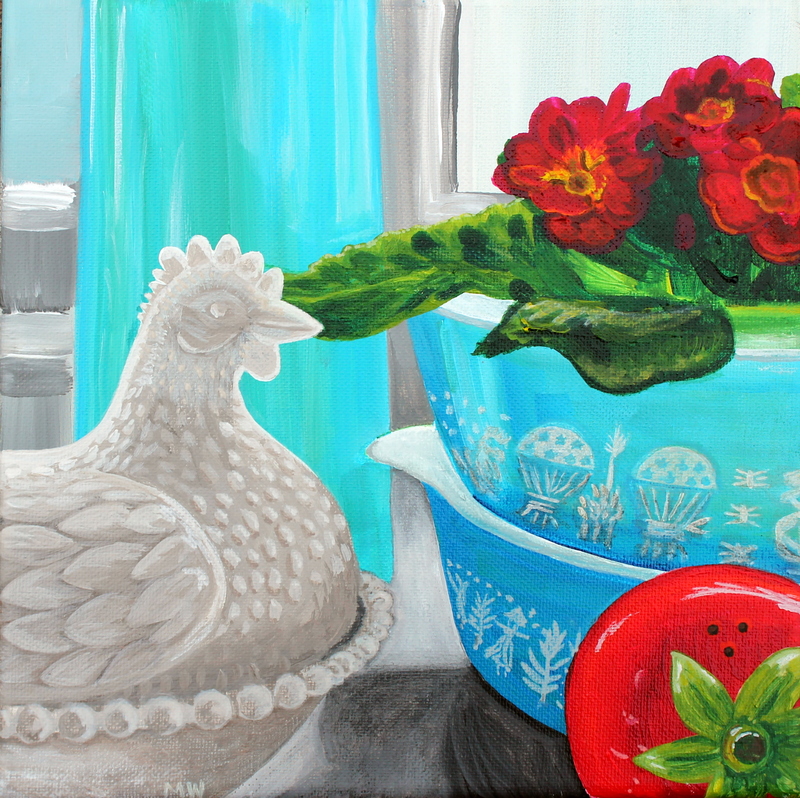 I titled this painting SPRING CHICKEN in honor of the forced spring flowers arriving at the super market. When I see primroses in the supermarket I know hope springs eternal. I will make it through the winter! And I have pretty little reminders on my window sill that the day will come when green pokes through the earth! I also used some of my favorite tchotchke, from around the house a vintage white glass hen and one of my tomato salt and pepper shakers. Also, vintage Pyrex in one of my favorite colors, aqua. I only used 3/4 inch paint brushes and up. Forcing me to abandon a lot of detail and decisively create permanent broad strokes. It’s a rather sweet little vignette of some of my favorite things. I shall hang it up to remind me of spring. Today is pottery day and I got to tie up a lot of loose ends. First, I trimmed my garden mug and added a decorative handle. Second I found one of my four bowls that I had never trimmed. I trimmed it up and sent it off to be bisque fired. Third, I created a vessel for my son’s mug. Owen changed his mind from a skeleton, to a monster, to now wanting a cobra mug. He wants a cobra with red blood dripping down the sides. Got to love six-year-old boys! Secretly, I can’t wait to create this handle! I also added an eye-ball to the bottom of his mug. I figured it would be extra creepy to have an eye staring up at you after your cocoa. 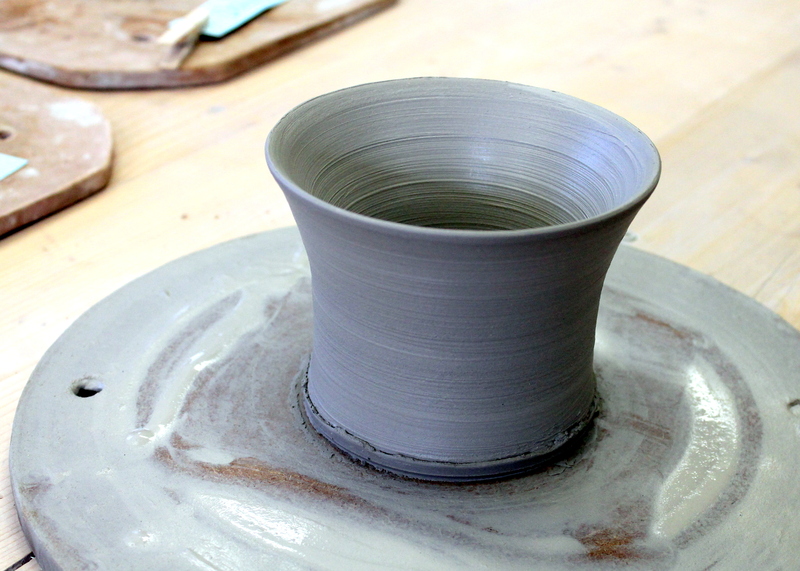 After, throwing the last mug, I then moved onto glazing. I glazed three different bowls in at least 8 different glazes. It took forever! You can see some papers I’ve included with ideas for patterns. If I don’t bring ideas with me, I freeze, forget and waste a lot of time. 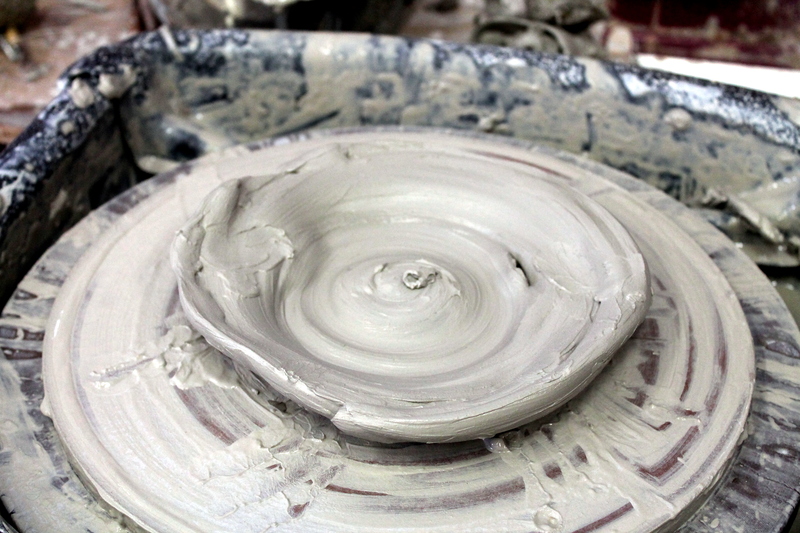 My designs are kind of risky, I sure have a lot of glazes overlapping which means you cannot predict the outcome. I sure hope they turn out well. Finally I moved onto under glazing the mugs. This is the first opportunity to add color. They will then be bisque fired and I will get a second chance to add more color through glazes. 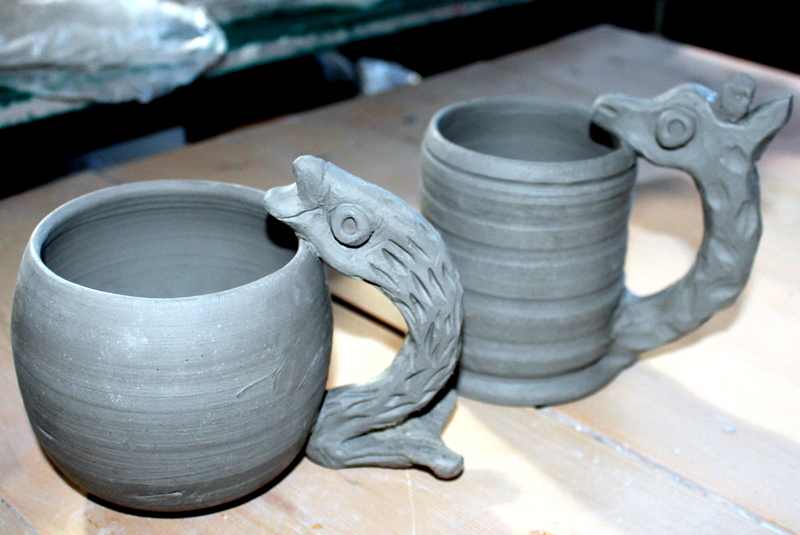 Three of the mugs are almost finished. I just can’t wait to take them home and use them! So there you go, It was a busy day at Plum Pottery East. I’m getting close to the finish line. Projects are close to completion. Woo hoo! So far, I have been deathly afraid to attempt acrylics during this daily challenge. It is not so much that I don’t know how to use them, it’s just that when I do use them I add layer after layer after layer. My larger paintings can take weeks! So my fear is wrapped up in the idea that I won’t be able to finish and then I would have to post a half-finished painting. I have some control freak issues going on as well as plain old unfounded fear. So, after I have recognized a ridiculous fear what do I have to do next? Tackle it! I bought a stack of 10×10 inch canvasses, a size I thought I may be able to handle in one day and this week I will attempt to conquer my acrylic painting fears. Here it goes……. Well, I finished the painting and it took longer than I anticipated. I started it at 9am and finished it around 4:30 give or take. I had a few disruptions throughout the day. I actually added another whole layer of details to this painting but it was too dark to get a good photo, so enough is enough. It’s time to quit for the day. All said and done. I enjoyed myself. I love these good luck cats. No matter what, they make me smile. From a technical standpoint, today I practiced sketching out the painting with paint on the canvas (no pencil like in watercolor). I worked from the background forward. 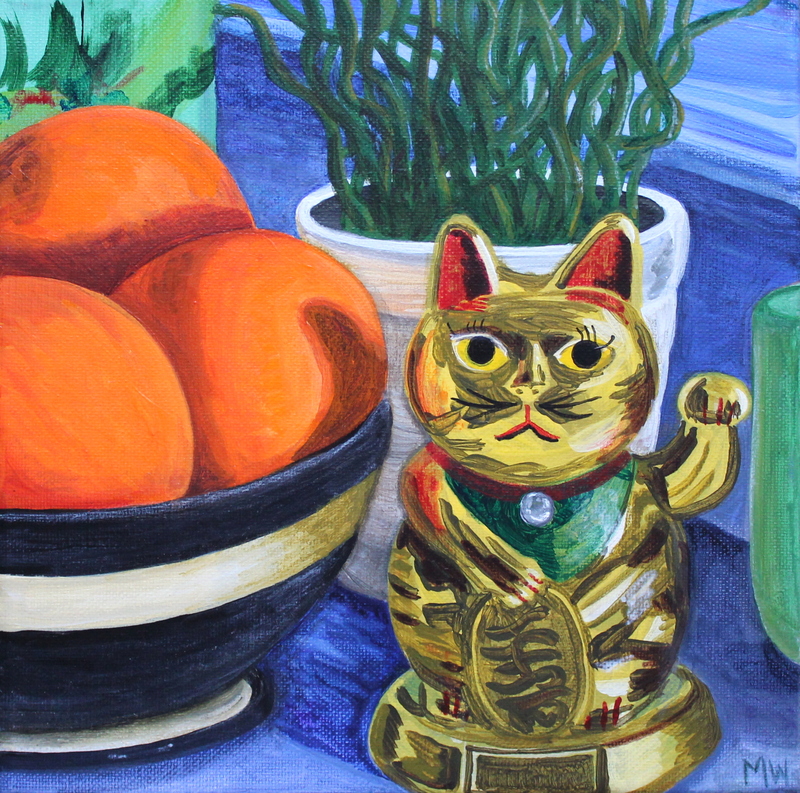 I loosely added the reflections to the cat without becoming obsessive compulsive and I also added details around the painting as opposed to concentrating on only one section at a time. These were all great lessons in a day’s work. Tomorrow is pottery, which will give me an extra day to think about my next acrylic painting. To be able to complete the painting in a six-hour time frame, I am either going to have to go with a larger subject matter or fewer objects in the still life. Either of these options should get me closer to my goal. That is what this whole 365 is about. Figuring out what I can do…when, why, how, & where…. which are all very good questions to answer. OK. I now have to take off my artists cap and put on my mom apron. Until we meet again! Boy oh boy, the kids kept me busy this weekend! Besides going to an awesome book swap and a friend’s birthday party, we mostly stayed home and created stuff. This first photo started the day. By 7:30 am my daughter and I were very busy creating a fashion show. I chose the old school 1980’s rub with a crayon plates and Liv went with the high-tech Y2K light box tracing fashion plates. I think I do the same girl over and over out of nostalgia for my youth. Girl with flower in hair, flower in hands, pants. I probably have 200 rubbings of the same darn girl over a life time! It so quickly brings me back to when I was 8 years old. However, my daughter, she kicks it up a notch. 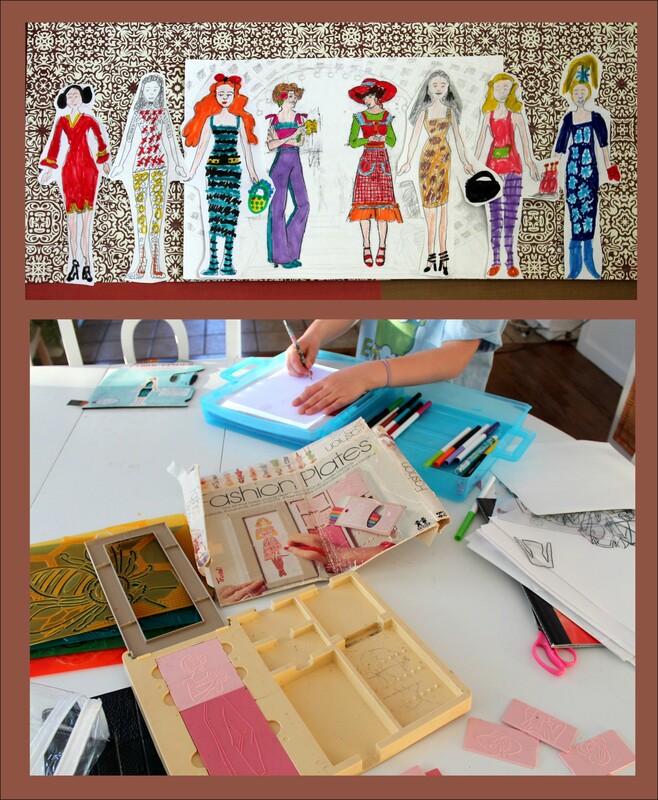 She only traces the face and body silhouette and then designs and colors her own creations. They are awesome to look at. She’s got some creative juices running in those veins! Next my son was complaining about the “baby Cuckoo clock” I had hung in his room a year ago. He is six years old and very matter-of-factly told me it had to go! I told him I wouldn’t take it down until we put something else up and that brought us to another weekend project. 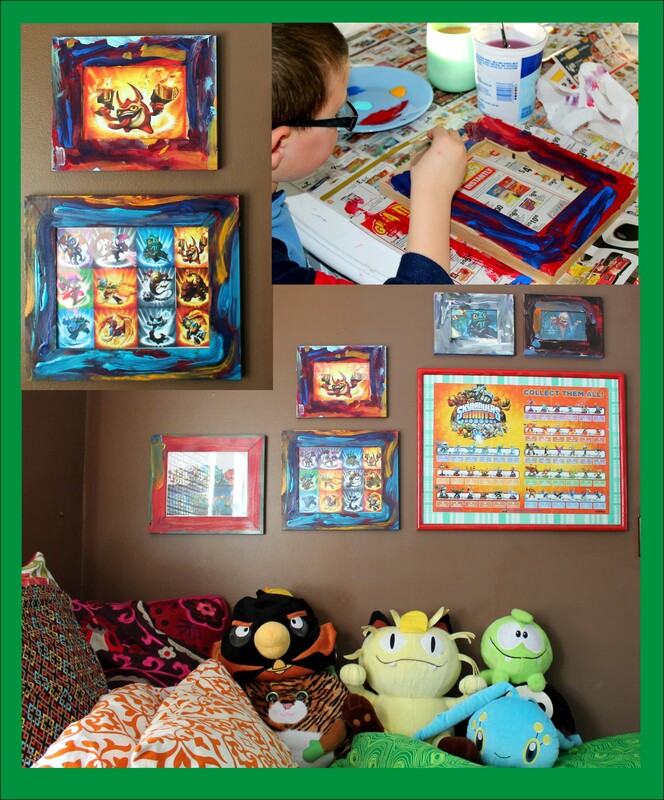 My son is totally into SkyLanders…I won’t bother explaining them because in two months they will be sooo passe. This is why I didn’t want him taping the images all over the wall. I just so happened to have a load of unpainted frames from a previous project and sent him to work creating very special frames where we can change out the pictures whenever he feels like it. Good compromise right? They look awesome. He did a great job. The third project was for mom. I’ve had my paint brushes in the same box for literally 15 years. They are always spilling over and I waste an enormous amount of time searching for just the right brush. My daughter wanted a sewing machine and to learn how to sew for Christmas. I thought this was a great beginner’s sewing project because there are so many straight lines to sew for each paint brush. After she started to learn how to sew, I showed my daughter how to splatter paint. 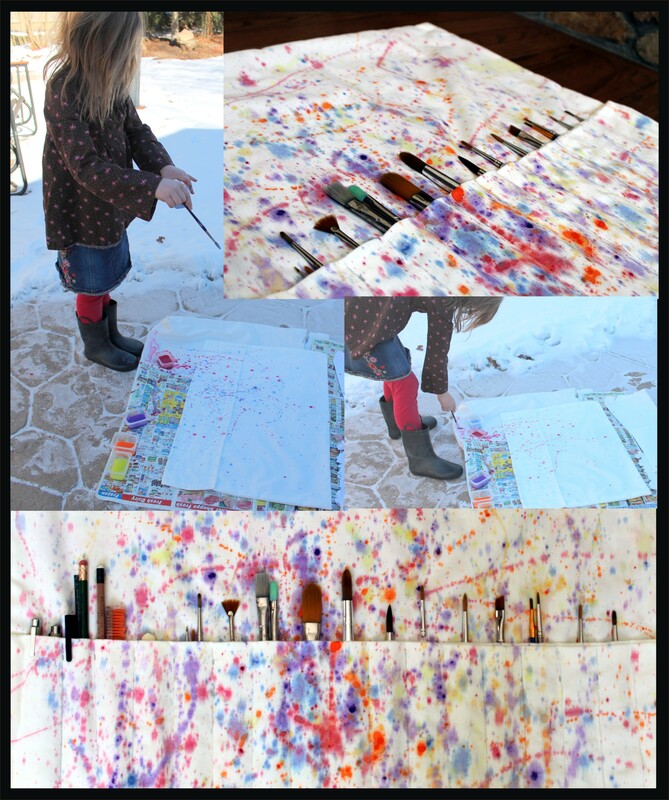 She loved this activity, but it was so cold the paint was freezing to the ground! Yikes. We somehow completed all of these projects by 1 pm which has allowed mom a little blogging time. Somehow, the painting Monday through Friday is a lot of work, but helping two little kids fulfill all of their little dreams, is plain old exhausting! Whoo, I think I might try to sit for 2o minutes before were off to a family Sunday dinner! Yay! My pottery bib necklaces are finally finished! I love them. They are totally funky and totally cool. They are not for the conservative at heart, that’s for sure! These are actually test samples. I learned a lot about what worked and what didn’t work. The necklaces on the top left and right were under glazed in black and then one was glazed in green and the other in a periwinkle blue. This was a failure. When they came out of the kiln the green and the blue were nowhere to be found. The black was too dark for the glazes to show through. A friend at pottery had the idea to try decorating them with nail polish because that is a form of enamel. This didn’t work either; the black was too dark. So next I went to these metallic paints I had and they did just the trick. The light hits the metallic particles and they glow. The olive-green one looks hideous in a way, but so cool on. The blue one reminds me of the inside of mussel shells, which is an idea I will have to revisit. 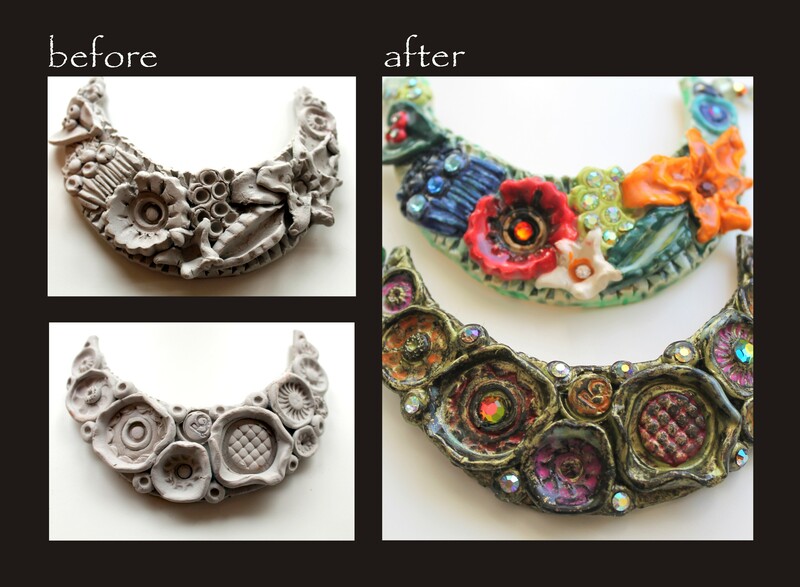 The center necklace glazes worked out perfectly. That was nice. So things to factor in the next time I attempt these is to flatten the arch shapes because the clay shrinks and these finished pieces are smaller than I intended. I need to rework the shape to fit around the neck better and calculate for shrinkage. The other idea I had was to create bezels out of the clay to add Swarovski crystals. This worked for the most part but next time I’d make the holes larger for when they shrink. Other than that, they are fully functional and ready to wear. I already have my outfits picked out for the week. Ahh, there is nothing like a new piece of jewelry! This painting is quite corny but somehow it got stuck in my head! I was thinking of the kind of day where you keep your jammies on all day. Even if you go outside you just stick your snow suit on over your PJ’s. 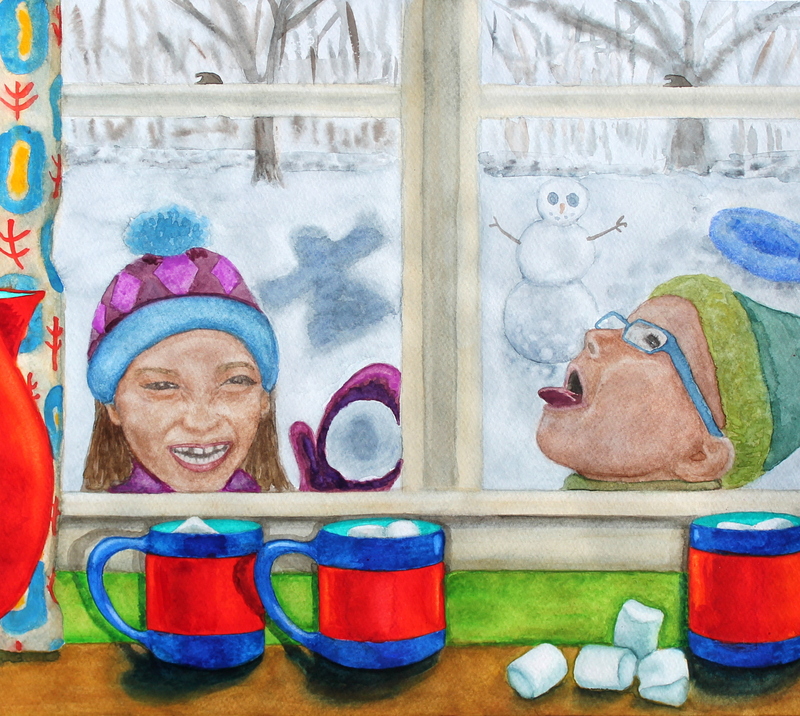 There are so many things to do on a snow day such as making snow balls, snow angels, snow men,riding on our snow tubes… Everyone has their own routine, but for me it’s sipping coffee and watching out the window. I love to watch my kids when they don’t know I’m watching. They do the silliest things. Face plants in the snow. Talking to a tree. Crawling under the patio furniture. All sorts of things. I added my son with his mouth open eating snow flakes. I can remember watching my mother last year as she watched Owen sit there for 15 whole minutes just catching snowflakes on his tongue. My mother was completely enamored. I have so many sweet memories tucked away in this head of mine. Of course it doesn’t last that long. At least it feels like they were only outside for 10 minutes before they come traipsing back in the house, filled with snow, creating puddles as they walk through the house! Then it is time for me to get to work. We have popcorn and hot cocoa every time there’s a snow day and the cocoa needs to be ready as soon as they walk in. It’s an important job. Hey, someone has to do it! That’s how snow days go. You watch too much tv, you stay in your jammies, you run out into the snow, you get cold, you drink cocoa, and if you have enough time you do it all over again! This painting is by no means perfect. I could critique it until the cows come home. But that’s not the point. The point was to try. The point was to conjure up some feelings and try to get them down on paper. To put myself in a happy place. I achieved this. I’m in a happy place so, I can rip this off my easel and try again tomorrow! 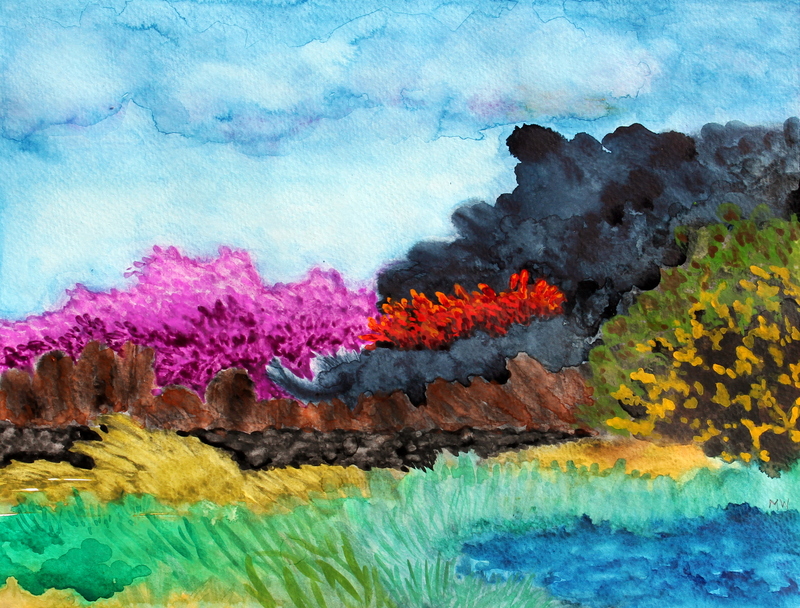 Today brings with it a classic watercolor landscape. 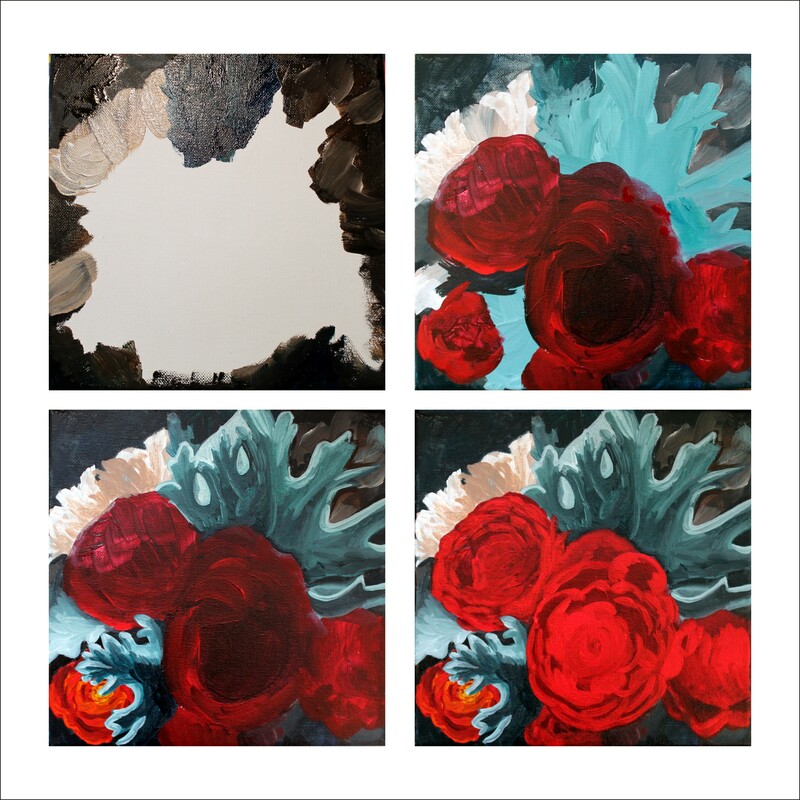 When I started it, the painting was primarily blues and grays. It kind of looked skeletal. Another word might be boring. I was about to scrap it when I thought about technicoloring it. Under each bold color field is the remnants of Payne’s gray, burnt umber, black & Antwerp blue. After the painting got a little bit of color infusion, I began to like it. Another technique I implemented was lifting the paint out of the painting. In the forefront the grasses were created by what remained of the pigment. It gives the image a lithograph feeling which reminds me of a New York artist named Harvey Kidder. Lifting the paint out of the front areas also gives the illusion of wind blowing through the reeds which you find a lot by the sea. It’s a sweet and simple little watercolor . I’ll add it to my pile! How awesome is that? I have a pile of art. I am only on day 23 and I have a nice little collection started here. I think this 365 Day challenge was a good call. It is whipping me into shape and forcing me to create a routine. If only I had the interest in exercise that I have in art; I’d be DIESEL! This is a color study of compliments. Are you with me? The opposite of purple on the color wheel is??? ….You got it! Yellow. In actuality there are many shades and many layers to this painting. I started with a periwinkle blue, added dioxazine purple, then ultramarine blue, paynes gray, and finally black. 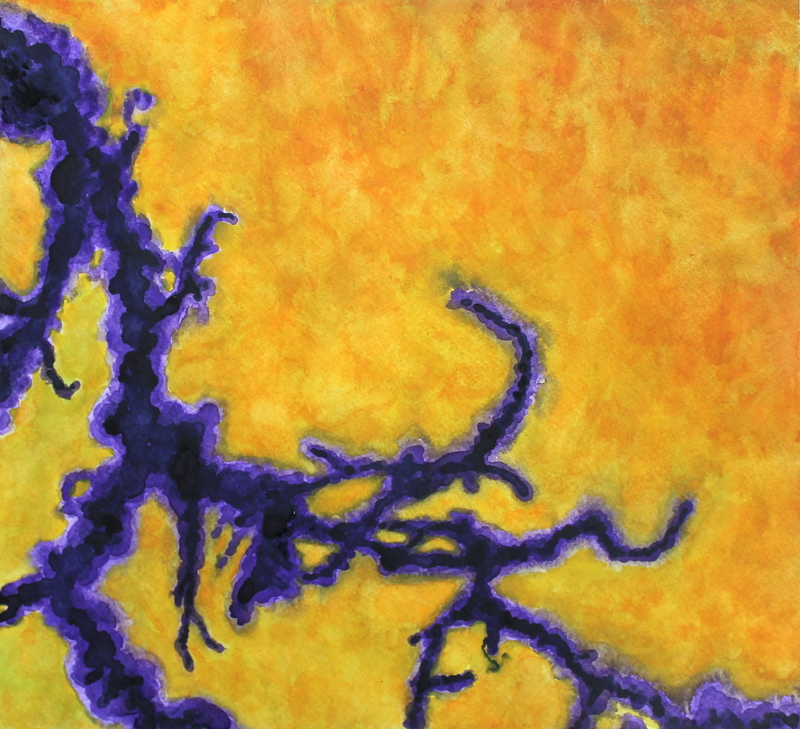 For the background I started with lemon yellow, sap green, burnt sienna, cadmium orange, cadmium yellow, and raw sienna. I just realized there are a second group of compliments at work here. OK. The opposite of blue on the color wheel is??? Orange. I hope you all got that correct. Pat yourselves on the back! Layer after layer, allowing the water to blend and move the colors, this tree like branch began to emerge. It is organic in form because I allowed the paint to take me where it wanted to go. In summation, there are two sets of compliments at work: Purple/Yellow & Blue/Orange. Why use compliments so dramatically? To create visual stimulation and movement of course. If colors are equal but opposite on the color wheel your eyes do not know where to focus or settle, which creates the stimulation. If you had an entirely neutral painting and added just one color, your eyes would settle there. But you know me. More is more! I don’t want your eyes to rest in a little corner of an image I want them to beg for sunglasses, or maybe a nap! It’s a perfect day for this image because everything is cold and white outside. Inside by my fire, this painting is illuminating my insides, which is just what I wanted. #22 -WHAT DO YOU THINK OF MY MUG? Yes, this was my final attempt at a mug today. The difference between this lovely lump of clay and the other mugs is that this one I attempted by myself! I really shouldn’t man the pottery wheel unsupervised! I have been humbled. It’s a good thing I have a great sense of humor or I might be crying right now! The truth is I still really need help from my instructor. It sure helps having someone help you center the lump. As well as tell you your arm is crooked, your thumbs are in the wrong place, You are putting too much pressure in the wrong area…Pretty much I need a professional holding my hand and preventing me from seriously screwing up! That day will come, it just might not be during the 365 Day challenge! On a happier note , with Rhea’s assistance I did create an awesome shaped mug for myself! If you recall, each member of my family is getting a new mug. My husband’s will have a fish theme, my daughter a giraffe, my son a skeleton and I want a garden theme. I can’t wait to sip out of my creation! Next week I will create a handle for my mug and start on my son’s mug. I wound up scrapping the pottery monsters and created new handles for My husband and daughter’s mugs. I’m glad I did. I am happy with these fish and giraffe sculptures. Next week I will under glaze them and get them into the kiln. 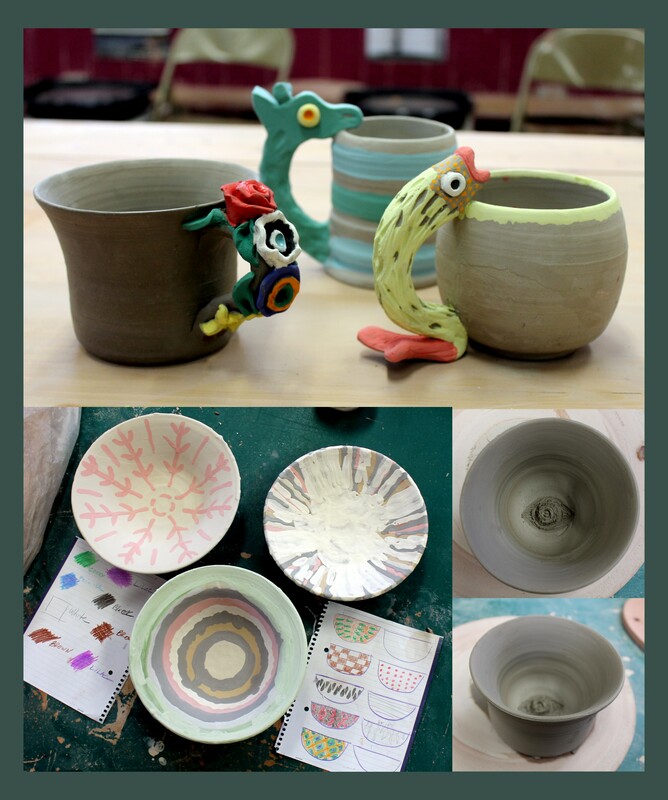 This week at pottery, I had some triumphs and I had some failures. Either way I had a lot of fun. I can’t wait to do it again next week!